In Sweden, a monument to Hetman Orlik was officially opened. In the Swedish city of Kristianstad, the grand opening of the monument and the commemoration plate to Ukrainian Hetman Pypyl Orlik (the author of the Constitution considered the first democratic constitution in Europe) was held.The opening was dedicated to 300th anniversary of Constitution written by Pylyp Orlik and to 15th anniversary of the current Constitution of Ukraine.The opening of the sculpture and the commemoration plate on the house where Orlik lived in 1716-1719 was initiated several years ago by the Embassy. 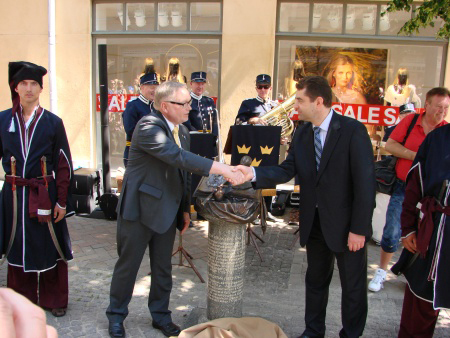 It is considered as a gift to the Swedish city of Kristianstad from Ukraine. According to Embassy’s press center, the monument was realized by sculptors Oles Sidoruk and Boris Krylov, architect Elene Sidoruk with the support of people's artist of Ukraine Bohdan Beniuk and patron Ivan Omelianiuk. 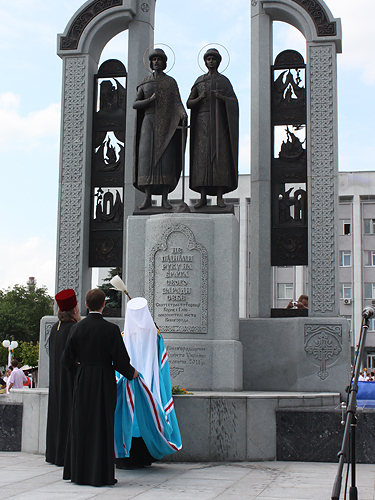 In Vyshgorod (Kiev region) the monument to holy martyrs Boris and Gleb, patrons of the city, was opened on 30.07.2011. The monument was inaugurated by the governor of the region Anatoliy Prysiazhniuk, his deputy Yaroslav Moskalenko and city mayor of Vyshgorod Viktor Reshetniak. The monument was consecrated by the Metropolitan of Vyshgorod and Chernobyl, governor of Kiev-Pechersk Lavra – Pavel (Lebed). The authors of the monument, Oles Sidoruk and Boris Krylov were awarded "Honorary Citizen" medals. The Metropolitan congratulated the residents of Vyshgorod with City Day and with the opening of the monument, and wished peace and prosperity to the glorious city. Borispol long been known for its trading roots and the fertility of land. People make legends about its cucumbers. 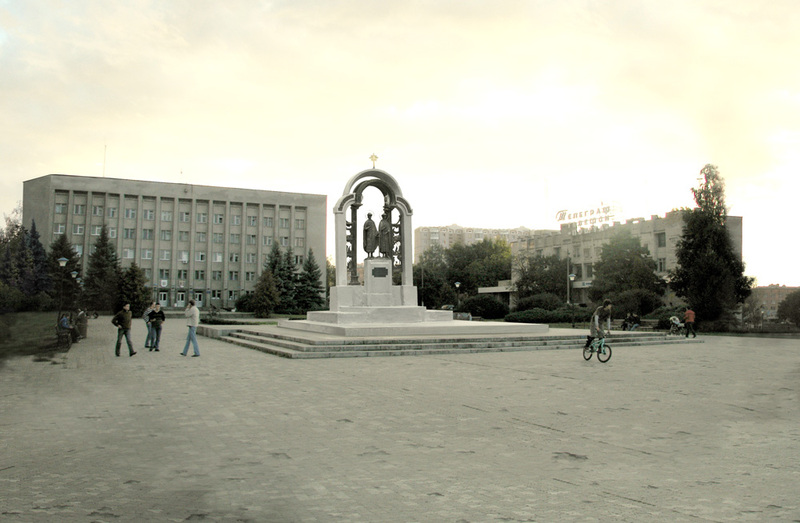 In connection with this, at the request of residents, Borispol’s city government decided to establish a genre composition, which would immortalize main activity of its inhabitants. Genre composition, which was developed by the creative workshop, is humorous in nature. 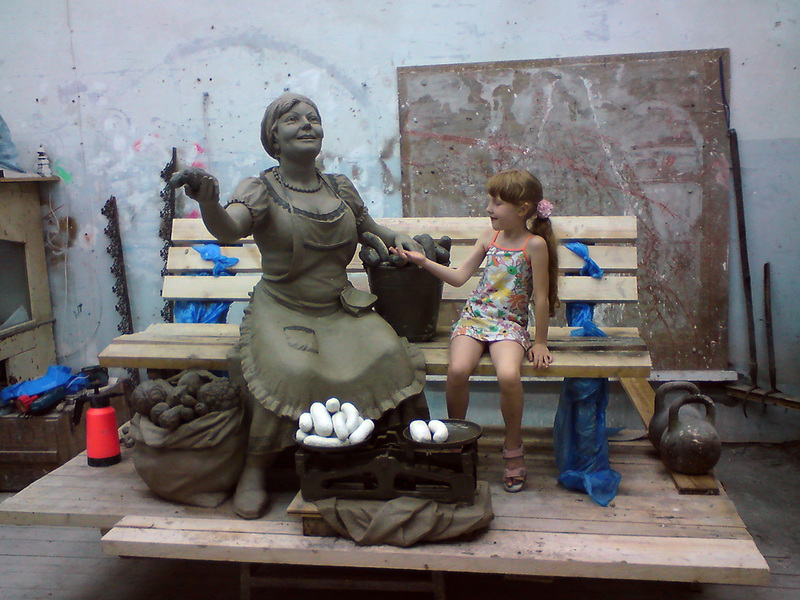 Arrangement will be made in bronze and installed near the central market town. Artists of the creative workshop are working on perpetuation of the memory of great saints Boris and Gleb in Vyshgorod. The monument is planned to be built of granite and bronze. 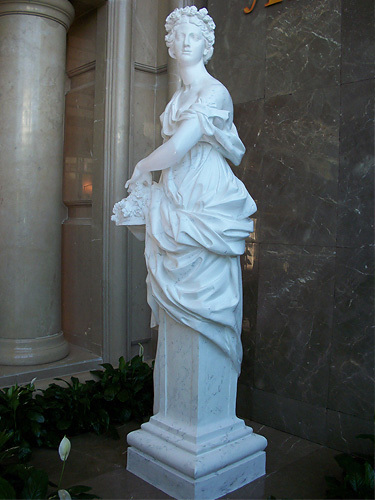 On both sides of the sculpture portrayed representations of lives of the saints. In the center of a composition are the images of the saints. Architecture of the composition symbolizes the church. The total height of the monument is 10 meters. It is established on honor of the fifth anniversary гостиници by "Rixos" Truskavets. On May 9th, a memorial plaque will be dedicated to the outstanding military leader, a hero of Ukraine, Army General Ivan Aleksandrovich Gerasimov, which will be installed on the building of the Ministry of Defence of Ukraine. Client - Ministry of Defence and Veterans Alliance.